How To: Find an iPad 2 Nearest You! How do you find an iPad 2? There are many different ways. You can stand in line in front of an Apple Store and hope that they have some in stock, you can order one online at the Apple Online Store, or you can look for resellers and hope they have some available. iPad 2 delays have made it very difficult to get your hands on an iPad 2. There is also some good news. The shipping times for the Apple Online Store have dropped to “Ships: 1-2 weeks”. That is a big improvement from the “Ships: 4-5 weeks”. You can also use the iPad2 Scanner. 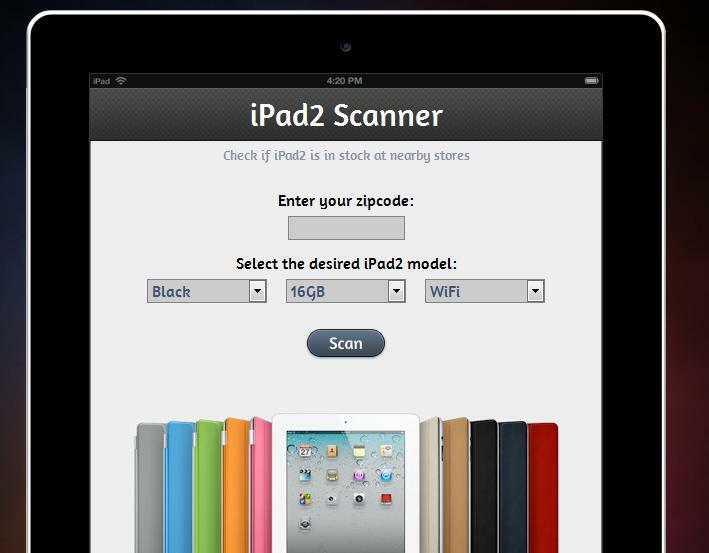 The iPad2 Scanner can help you find an iPad 2 at a Target store. It is fairly straight forward. Just put your zip code, pick your desired model, and click Scan. It should come up with a list of Target stores nearby and will tell you if the iPad 2 you selected is available. I would still recommend ordering your iPad 2 online because it only takes 1-2 weeks to ship and the shipping is free. You also get to engrave your iPad 2 for free, so I think it is a better bargain. Good luck on your search for an iPad 2!